Taste and see that the food is good at this small, soulful eatery. 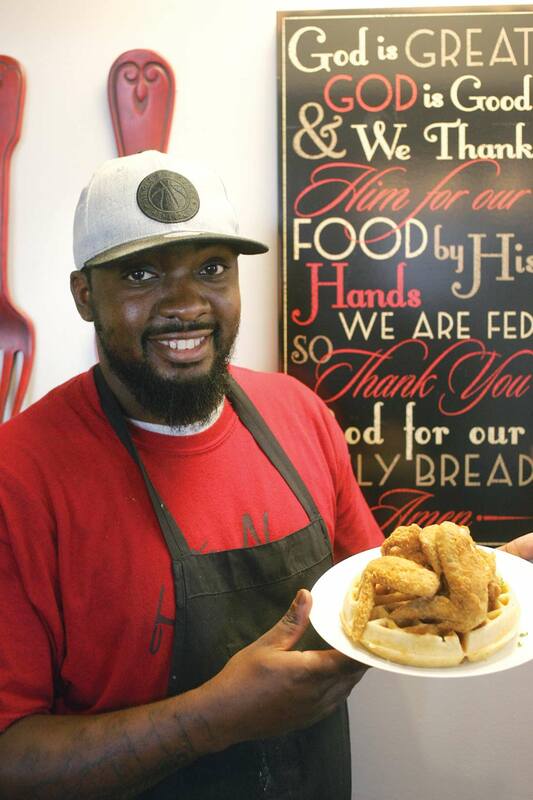 Co-owner Demarcus Davis serves one of Taste N See’s signature chicken and waffle dishes. Photo by Lee Chastain. It’s easy to drive right past Taste N See Chicken & Waffles. 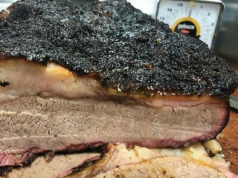 Located in a strip mall on Altamesa Boulevard, the eatery opened in June on a street that’s jammed with fast-food joints, storage places, and dollar stores. And the little café’s signage is hard to see. 3329 Altamesa Blvd, FW. 682-708-7115. 10:30am-6pm Sun, 10:30am-8pm Tue-Sat. All major credit cards accepted. 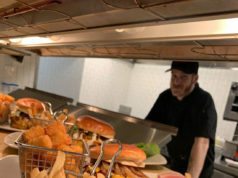 The menu at the 13-table restaurant is fairly simple but covers all of the Southern bases: shrimp and grits, fried chicken and chicken strips, fried fish, some down-home sides, and the eponymous main dish. Order at the counter, but be aware that apparently the people staffing the register have varying levels of comfort when it comes to providing recommendations. The young woman who took our order was sweet and polite but not particularly helpful with suggestions. However, if you’re at a place serving chicken and waffles, it’s probably safe to start with them. The chicken atop the waffles turned out to be three giant wings just slightly smaller than the appendages on a Thanksgiving turkey. The bird was perfectly seasoned, crunchy without being dry, and not the least bit greasy. Waffles come plain with a traditional, slightly sweet batter, but for a small upcharge you can flavor the mix with blueberry, pecan, chocolate, or bacon. We noticed the bacon option just after ordering the pecan upgrade and were momentarily disappointed with our haste. But the pecan waffle turned out to be gloriously flavored with chopped nuts and a delicious caramel sauce drizzle. The huge, house-made waffle was wonderfully crisp on the outside and soft and fluffy on the inside. Butter and syrup were offered at the table, but the dish needed no such frivolities. Shrimp and grits also seemed like a good choice but proved to be a mixed bag. We ordered the grits with cheese, and there was a bit of gooeyness to the consistency of the mush but no real flavor and no cheese on top. In the photos on the restaurant’s Facebook page, the dish is shrouded in a shredded cheese and bits of bacon. Sadly, neither was included in ours. Five well-seasoned tail-on shrimp were spicy and delicious, and perhaps the grits were made deliberately bland to serve as a backdrop for the tasty shellfish. At just under $15, the TNS chicken is the most expensive dish on the menu, and it’s definitely not bland. Baked chicken breasts were covered in a luscious, explosively spiced cream sauce augmented by zesty sausage, plump boiled shrimp, and green beans. The breast was a tiny bit dry, but the layers of flavor in the cream sauce more than compensated. The very Cajun slant to the sauce was an unexpected delight. The entrée also came with two sides –– options included rice, sweet potato, grits, biscuits, and mac ’n’cheese. The sweet potatoes were a little dish of heaven: soft-cooked yams in maple syrup with a heady flavor and an almost floral aroma. Like the waffles, the side was almost good enough to be dessert. The mac ’n’cheese was a little disappointing. The macaroni was excessively soft, and the sauce was pale and bland. 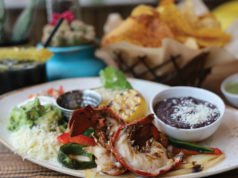 The restaurant’s name comes from Psalm 34:8 –– “Taste and see that the Lord is good.” Generous portion sizes pretty much assure that nobody’s going to leave hungry. The restaurant’s location between the Edgecliff Village and Wedgewood South neighborhoods makes it a nice sit-down, family-owned space among the seemingly endless row of fast-food joints lining the street.